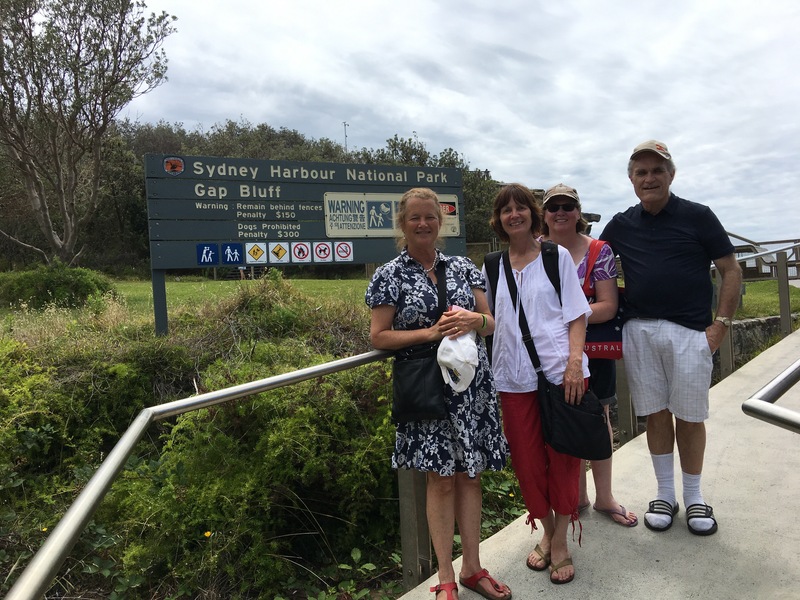 Annie and I are heading home after 2 unforgettable days in Sydney with Blaine Ray. What an amazing time and I still can’t believe how fortunate we have been. Firstly how lucky were we to have Blaine Ray to ourselves almost for 24 hours! We did share him on Tuesday with Stef and her son Daniel, but considering that she is heading up to the conference in Brisbane this Friday, this was a bonus! We were able to pepper him with questions and then listen to his explanations while taking notes. It felt like our own personal workshop specifically tailored for our needs and level. Words simply cannot express how amazing this was and we’ll always be indebted to Blaine for his kindness and patience. 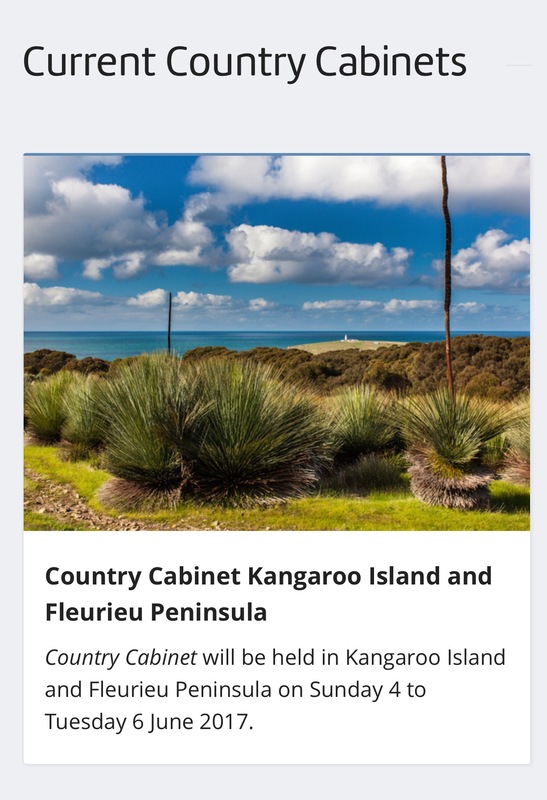 Secondly, we were able to practise our note taking skills ready for next week’s inaugural TPRS conference on the Fleurieu Peninsular with Terry Waltz & Lizette Liebold! It has been fascinating comparing our notes and seeing the huge gaps in my notes where at times I must have become so engrossed in the conversation I forgot to write anything down! Annie has diligently cross referenced both sets of our notes and created a version that incorporates everything and then on top of that has presented it out beautifully. 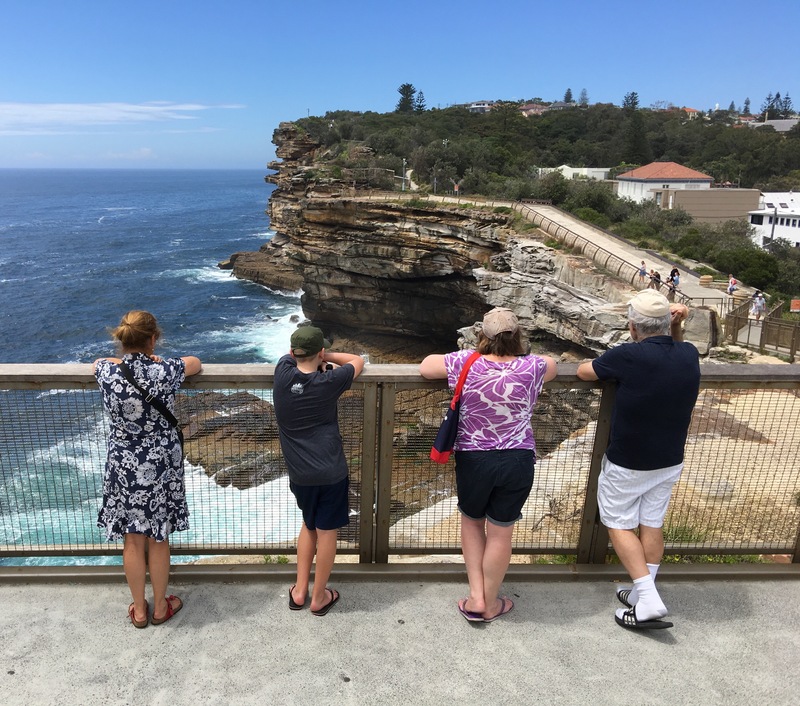 And thirdly, it was simply a lovely break spending 2 nights in Sydney and being a tourist in such a beautiful city with like minded people. We spent most of our time together either walking or eating along the scenic waterfront. 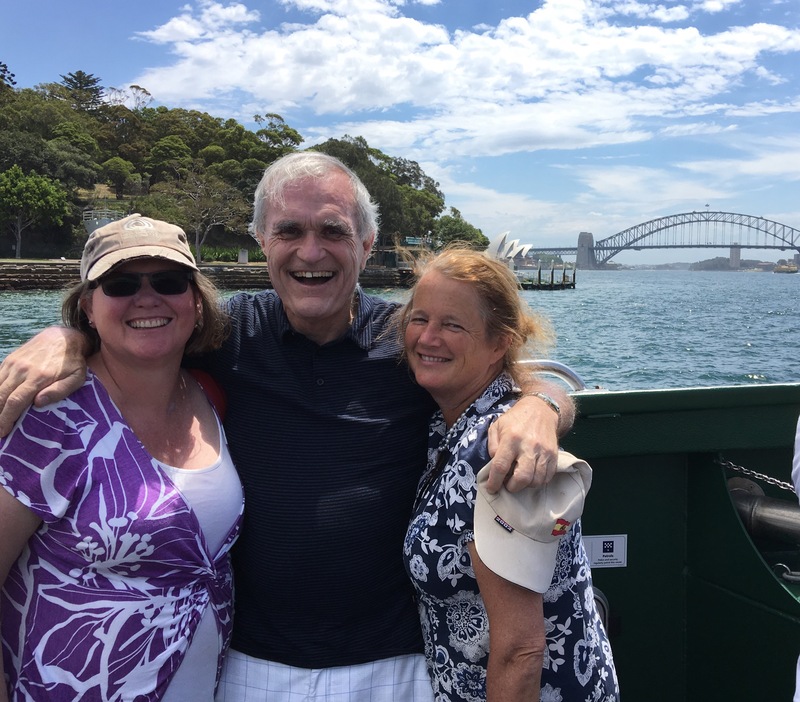 Except for the initial trip to our hotel from the airport, all of the travel we (Annie & Cathy) did in Sydney was either by ferry or by train and this is definitely the best way to travel. The ferry system is efficient and relaxed. It was just lovely sitting or standing on the ferries enjoying the gorgeous scenery and the cool breezes with the added occasional bonus of sea spray. The trains too were great. 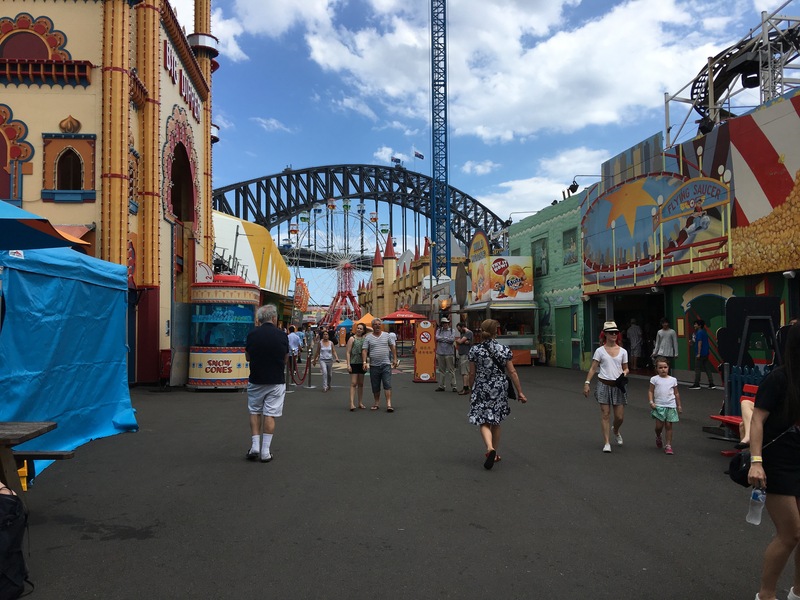 So much quicker and took us directly to the domestic terminal which was in direct contrast to our long and tiring trip on arrival which took at least an hour of zig zagging throughout the CBD streets of Sydney. I’m so grateful that Annie talked me into exploring alternative travel options for our return to the airport! What a generous and gracious person Blaine Ray is. 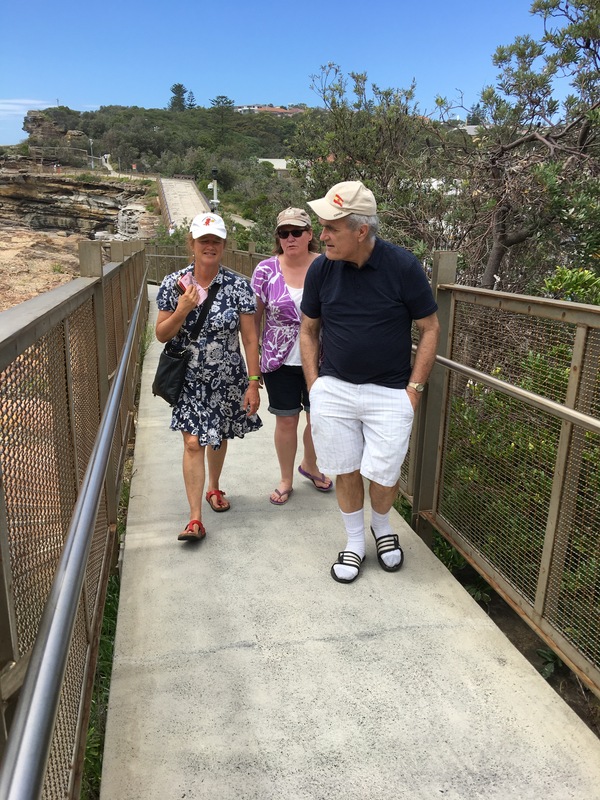 He happily and enthusiastically shared his knowledge with us and was genuinely impressed to discover that we are 2 of 3 language teachers on the south coast who have been teaching with TPRS in since 2014. He told us afterwards that he had presumed we had only recently heard about TPRS and therefore surmised that our discussions would lack any deep TPRS connection. In fact we spent every single minute chatting about various aspects of TPRS and Blaine answered all of our questions and gave many demos to illustrate his points. 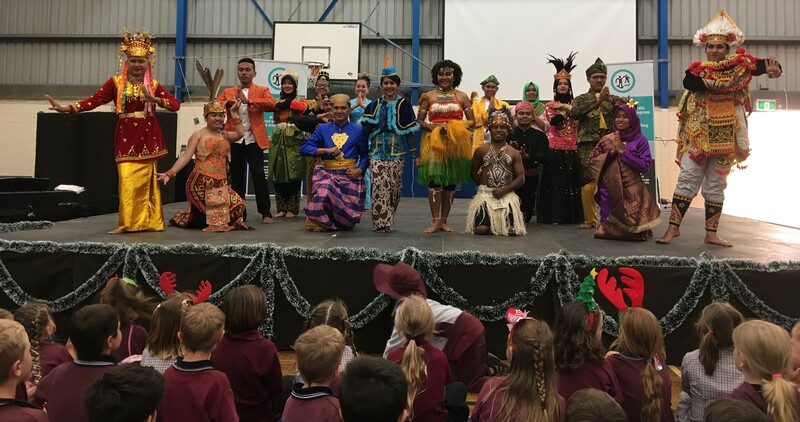 He also encouraged us to share all that we learned; a huge relief because I couldn’t wait to write up this post! I particularly appreciated his personal stories which clearly illustrate his open mindedness towards improving TPRS, unlike others who have created a successful model and then constantly ‘protect’ the model/concept fiercely. Blaine told us of several instances where he had witnessed or discussed with a practising TPRS teacher a successful idea of theirs, which he immediately saw the value of incorporating it into TPRS procedure and then gave that teacher full credit for that update! Alina Filipescu is one such teacher and after seeing several of her youtube videos, I fully understand why Blaine Ray would be impressed by her teaching. Annie, are you a girl? Yes, you are a girl. Class, Annie was a girl. This leads on nicely to Blaine’s comments about actors. He made it very clear that choosing good actors is critical. He explained about having auditions to select the best actor which is an idea I’ve tried but not while focusing on the target structure which would be an awesome way in which to add additional input, rehearse the structure and develop student confidence. A good actor must be enthusiastic, must want to try and must have the mindset that this is a cool class. We loved his line that actors have the opportunity to be in the movie rather than to just watch it! If however, the actor is not performing (maybe he/she is shy or reluctant to act in an exaggerated fashion), try whispering in their ear hints or even demonstrating the required action and if they are still unable to act in the engaging manner required, it may be necessary to replace them. Choosing a bad actor gives negative messages to all the students about our subject. 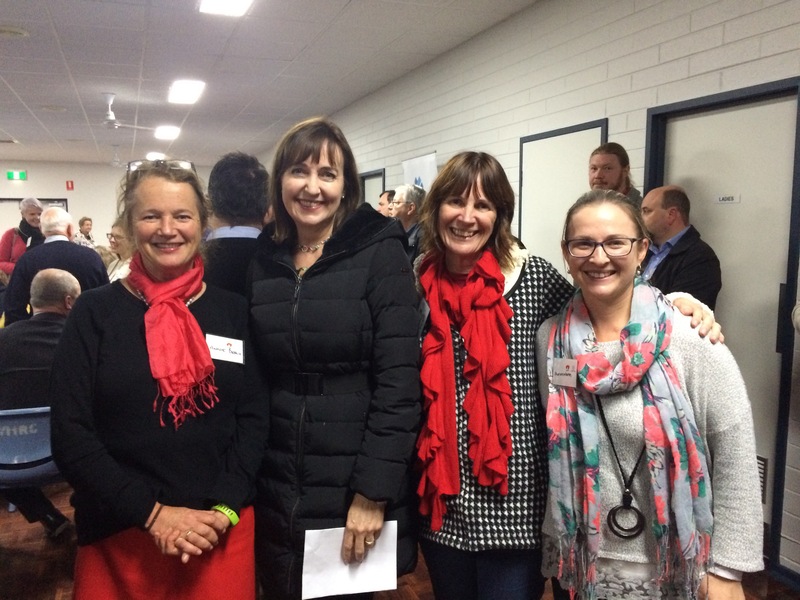 Blaine’s statement that every teacher has a battle for the students hearts resonates for me in my school where we can have up to 5 specialist teachers on top of their class teacher and other support staff. He says the way to win their hearts is through comprehension and play! Our meals with Blaine were spent juggling our plates & cutlery with our notebooks & pen. Meal times were perfect times to focus on specific aspects of TPRS. The first evening, Annie took notes while I hesitated to pull out my book. Afterwards back at the hotel, I quickly wrote down all that I could remember and was horrified at how much detail I couldn’t remember. From then on, as soon as Blaine began talking, I would whip out my note book and note down the salient points using some of the shorthand I haven’t used since teachers college lectures! 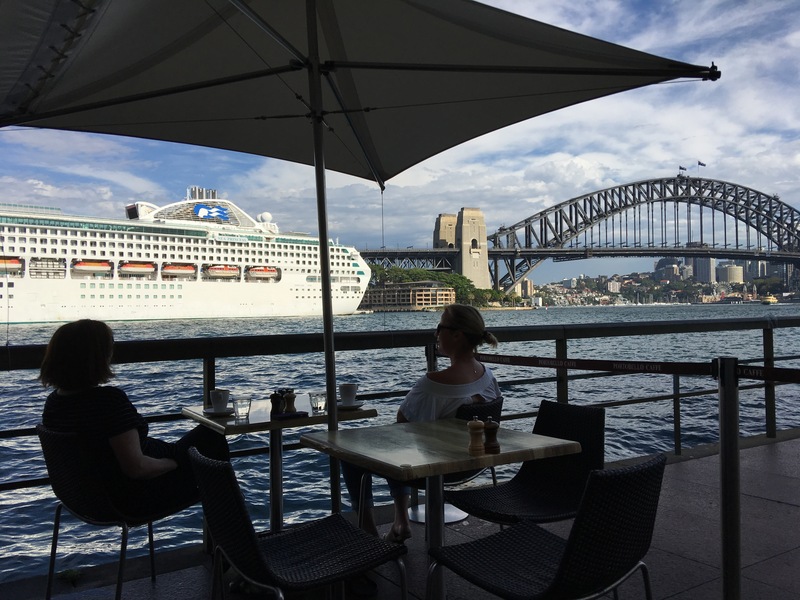 Over our first al fresco breakfast in Pyrmont, Blaine discussed circling. Questions are the backbone of TPRS and are the key difference between TPRS teaching and everything else. He told us of studies which showed that TPRS teachers ask 3-4 questions a minute whereas legacy teachers rarely ask ANY questions. Questioning is critical because it gives students the opportunity to rehearse while giving the teacher the opportunity to get repetitions on just one sentence. Just as critical though are student responses. He told us about Alina Filipescu who coaches her students to give powerful responses. I am definitely going to investigate that idea as I agree it is a skill that needs explicit teaching. Answering questions demonstrates comprehension and understanding. Blaine has 3 procedures for evidence of student engagement. Respond to new statements with ‘ahh’. If I ask a question, respond in the target language. If I ask a question and you don’t know the answer, guess in the target language. Surprise me with your guess and if you don’t surprise me, I will surprise you! 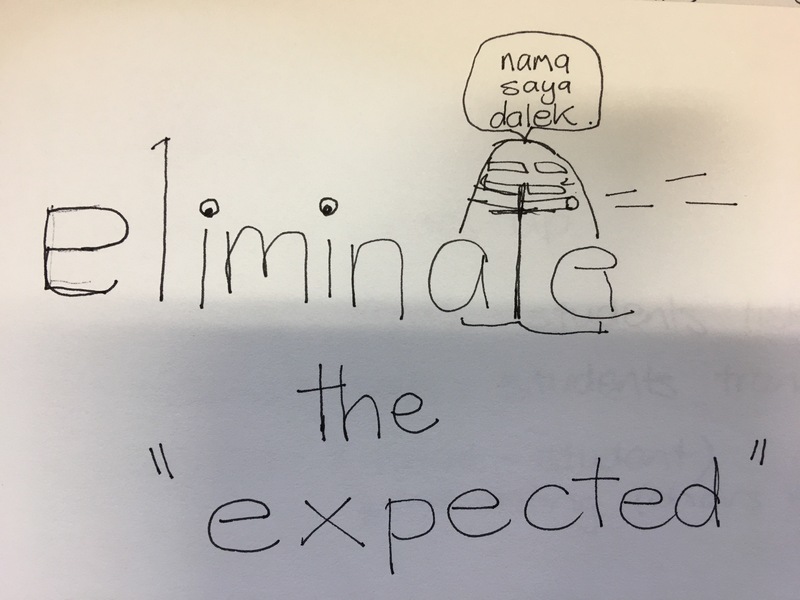 Never speak negatively about this class.Regarding point 2, Blaine recommends teaching early on a phrase such as, “I like this class” (Kelas Bahasa Indonesian keren) and whenever a student speaks negatively about the lesson or class, insist they repeat this phrase while reminding them of rule no 2. Personally I can’t remember anyone stating publicly in class that they dislike my classes or lessons, I just get occasional glowering glares or disengaged expressions which I usually do not draw attention to and work harder to turn their attitude around. For one student this happened when she became the class artist. A major theme that underlay every discussion we had with Blaine was student confidence and teacher patience. He highly recommends all language teachers experience learning a totally new language to fully enable us to empathise with our students. Teacher thinking about language learning is usually wrong. We have forgotten just how it feels to be a learner and why students want and need patience from their teacher. Teachers can not make their students learn any faster, the only way we can help with their acquisition is to provide more repetition. Obviously it the final stage we are aiming for with our students! This post is my grasp of Blaine’s explanations. I hope it is true to his understandings and should there be any errors, I fully accept that they are evidence of my ongoing and constantly developing comprehension of TPRS. 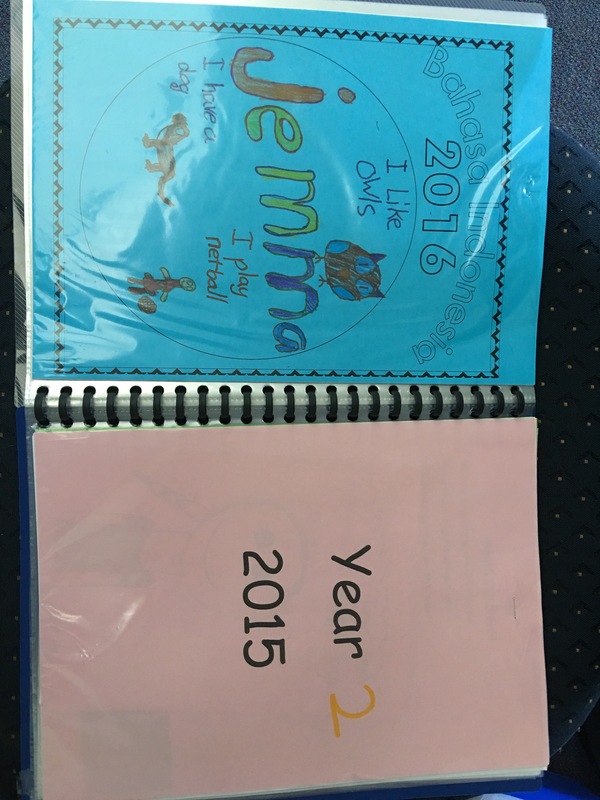 Student Work – Books vs Folders? When I first arrived at this school, piled up in the bookcase were huge piles of student workbooks from the previous year’s teacher – most of which had been barely been used. I then repeated this pattern myself for the next few years!! I always felt uncomfortable at the end of each year sending the books home. If the books were not full of book work, did parents assume students had not done anything? Would I and/or my program be judged if student work was untidy or unmarked or if there were incomplete tasks? After a few years of this dilemma, I trialed ordering students a folder each instead of a lined book. At the end of that first year, instead of sending student work home, students took out all their work sheets, and put them together in the back sleeve of their folder with a back sheet stating their year level and the calendar year on one side and their front cover in the other. We discovered early the following year, that it was best to staple this together to prevent pages falling out mid lesson and also so that work doesn’t get mixed up from year to year. I have been doing this for nearly 10 years now, and over the last few years, it has been lovely handing the folders to my graduating year 7’s as it contained work from each and every year they have been here at PEPS. Each year, we begin the program with a front cover for their folder. 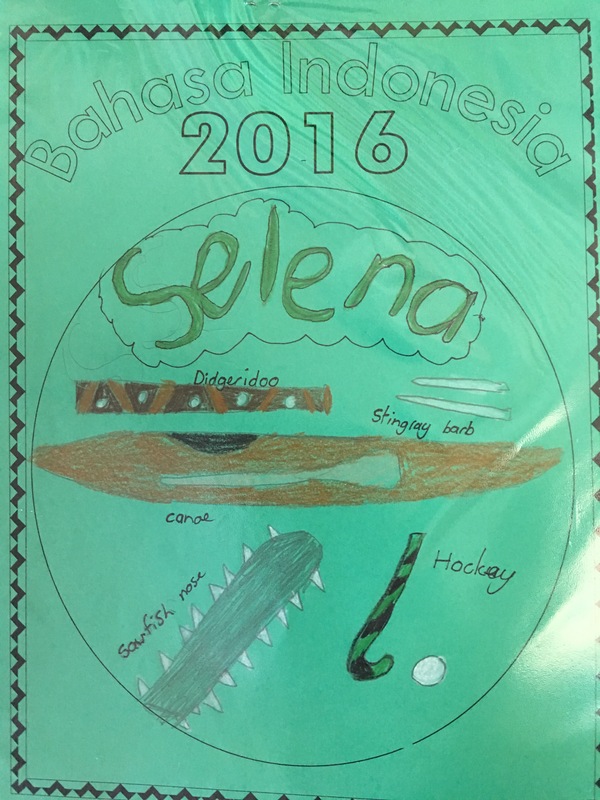 This front cover has many uses but the main one is to ensure quick and smooth distribution during lessons, therefore their names must be bold and eye catching! When I taught thematically, there would be 4 boxes on the front cover, each one representing the 4 terms in our school year. In each box there would be either an illustration for each term’s theme or it would be blank for the student to draw their own picture inside it. 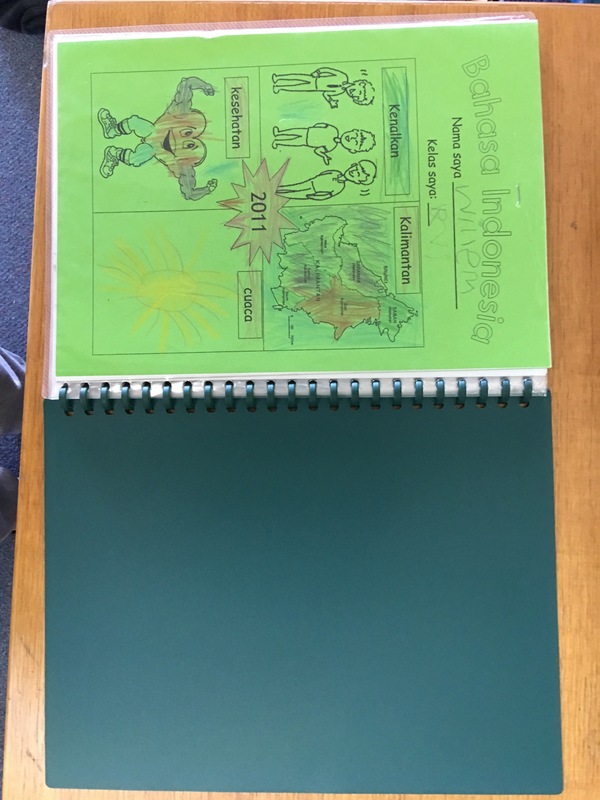 At the end of the year, this front cover is stapled strategically facing the back cover, so that reorganising the folders at the start of each year is made slightly easier. Since beginning with TCI/TPRS, our front covers has changed significantly and the main reason for this is that week one of each term is the best week!! It is the week when students are most settled, most cooperative and most are absolutely delighted to be back at school so it seems absolutely crazy to spend that week colouring in!! Now, the front cover is only done in the first week of the year and it helps me to gain greater insight into my students likes and dislikes which hopefully strengthens our student/teacher relationships. 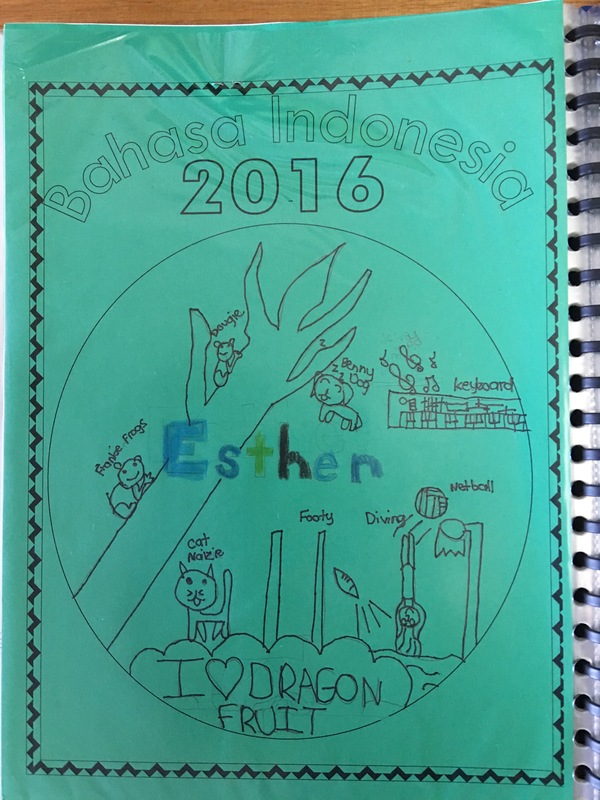 My first cover in 2015, was based on the expectations of students in the Indonesian classroom and was a great way to introduce Teaching Proficiency Through Storytelling to students. Last year, after discussions with Sharon & Annie, We all used the front covers to collect information about students that could be used in class stories. Unfortunately my design was too ambitious and was only completed fully by a few classes. 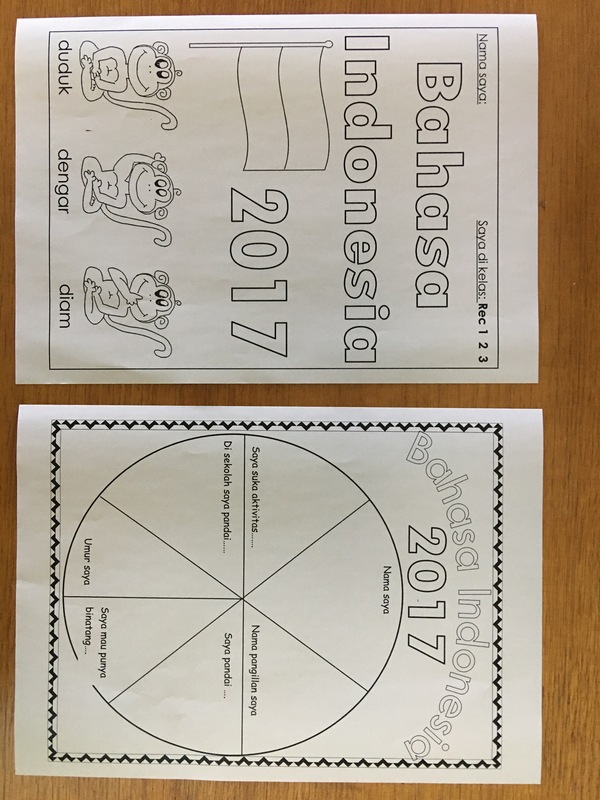 As the week progressed, each class’s front cover was tweaked more and more so that for those classes that only had that one Indonesian lesson that week, the cover could be completed in a single lesson and didn’t run into week 2! JP firstly then MP & UP.